August 2017 – Talva Design Talva D.
Green Paros is a collaborative group and online platform of people living in Paros or who are interested in Paros, who share common values of preserving the authentic lifestyle on the island by encouraging and creating sustainable activities , Social, environmental and economic issues. Initiated and invented by the artist and creator Tal Waldman Talva D., co- realized with the manager in place Ronit Ben Saadon, co-founder of the Tao Center. With the help of Roula Kavalli, interior decorator and member of the Cultural Association of the village of Prodromos. 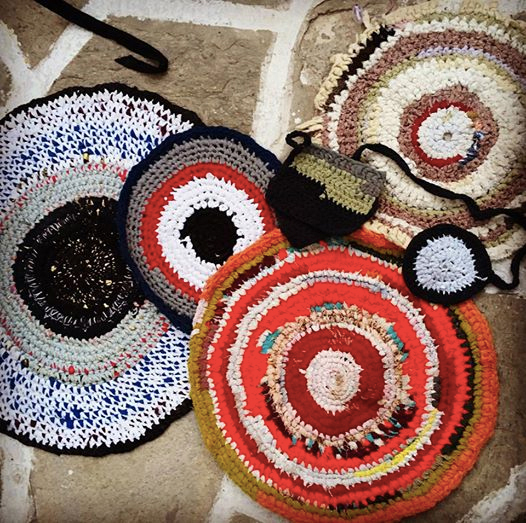 This summer we supported and collaborated with the Prodromos association in the traditional chickpea festival and we also organized a workshop to revive the tradition of local carpets using recycling. A workshop that welcomed nearly 30 people with enthusiasm, some of whom looked for old carpets from their families. Wishing to be inspired by this tradition, we are working to create a contemporary carpet production and thus not only preserve the carpet tradition but also meet social, economic and cultural needs during the slow winter period. In November we want to start a weekly production rally with our GREEN PAROS WINTER GROUP and, until summer, create a collection that resonates with the Green Paros manifesto. In the photo, 2 contemporary rugs and 2 old 70 years old, can you guess which are old and what are new?